Photographs by Chip Cooper, University of Alabama faculty member and artist-in-residence, and Cuban photographer Julio Ángel Larramendi Joa have been on display since June 4 at the Massimiliano Massimo Institute in Rome in an exhibit titled “ Campesinos.” The exhibit will be on display for a month in Rome before traveling to other Italian cities, and is part of the celebration of the 80th anniversary of diplomatic relations between Cuba and the Vatican. 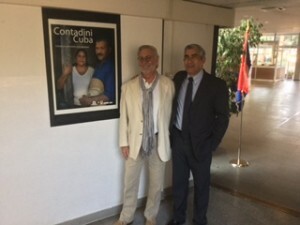 UA photographer Chip Cooper with Cuban photographer Julio Larramendi at their exposition in Rome. 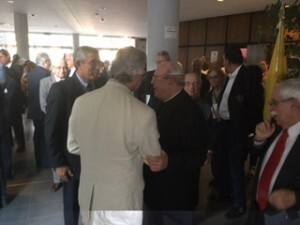 Photographers Chip Cooper and Julio Larramendi enjoy a moment with the cardenal of Cuba, Jaime Ortega, at their show in Rome. 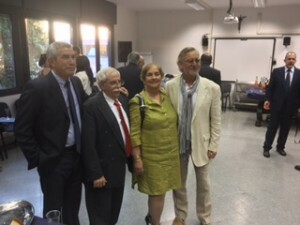 Julio Larramendi, Cuban ambassador to the Vatican and his wife, and Chip Cooper.